My father-in-law, after watching a World Cup game Saturday, said “I think there’s something wrong with my TV. There’s a constant static.” No, Ned, do not adjust your set. Those are the vuvuzela trumpets. I assume it’s constant because out of a crowd of 100,000- any given 20,000 people have not run out of breath and are blowing their little hearts out. Then when they tire, the next set of 20,000 people take over. It has not yet sent me over the edge but others are beginning to crack. John Leicester with the Associated Press has pretty much lost it. JOHANNESBURG (AP) The constant drone of cheap and tuneless plastic horns is killing the atmosphere at the World Cup. Where are the loud choruses of “Oooohhsss” from enthralled crowds when a shot scorches just wide of the goalpost? And the sharp communal intake of breath, the shrill “Aaahhhhss,” when a goalkeeper makes an acrobatic, match-winning save? Or the humorous/moving/offensive football chants and songs? Mostly, they’re being drowned out by the unrelenting water-torture beehive hummmmmmmmmmmmmmmmmmmmmmm of South African vuvuzela trumpets. Damn them. They are stripping World Cup 2010 of football’s aural artistry. 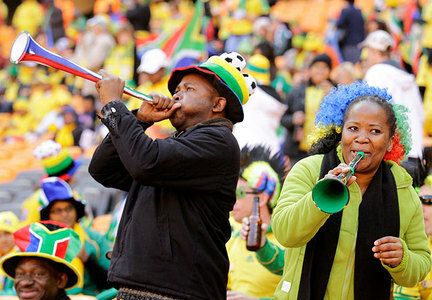 The good news for South Africans is that these vuvuzela trumpets generally sell for a dollar but for the World Cup are going for $15. Clearly, someone’s getting rich here, but that’s ok; a lot of South Africans need this extra cash. As for Mr. Leicester, upon further review, his entire article seems to reveal an intimate knowledge of British soccer, leading me to believe some of his frustration may be due to that 1-1 tie between England and the United States Saturday. Frustrating for the English, that is. Can’t be fun to watch your goalie turn an easy save into a goal for the opposing team, making a fool of himself like that before hundreds of millions of viewers across the planet. I suppose if my team had blown it that badly, stuff like never-ending, head-splitting, droning trumpets might very well add to the level of general irritation. On Olive Branches and Peace Offerings World Cup- Curses!